Avs100. Magnetic mill. Intensifier of Technological Processes AVS-100. Electromagnetic systems with ferromagnetic elements are designed to intensify various physical and chemical processes. The unit operates on the principle of transforming the energy of electromagnetic field into other forms of energy. The unit is a chamer (pipeline) of 90-136 mm diameter, located inside rotating electromagnetic field inductor. There are ferromagnetic cylindrical elements of 0.5 – 5 mm diameter and 5 – 60 mm length in the operating area, from several dozen to several hundred (0.05 – 5 kg), depending on the volume of the work zone (fig.1). 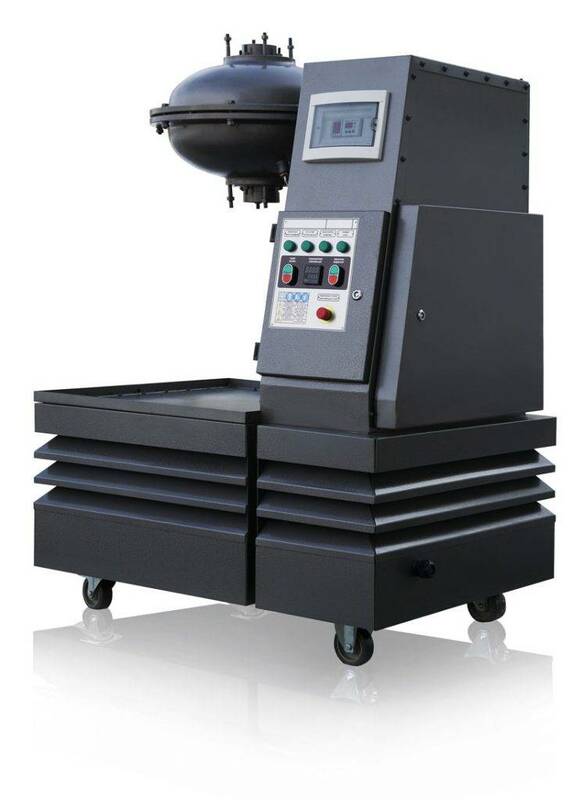 The main components of electromagnetic units with vortex layer are: the inductor of rotating electromagnetic field with cooling system, connected to three phase 380/220V, 50Hz power supply, and operating chamber with ferromagnetic elements (Fig. 1). The rotating electromagnetic field causes the ferromagnetic elements in the work zone to move and create the so called “vortex layer” (Fig. 2). In production of these electromagnetic devices the important parameters are magnetic field parameters and the dimensions of the chamber. The magnetic field of the inductor is characterized by strength, which does not depend on the medium, but only on the geometry of the contour and electric current, measured in A/m. The main characteristic of power interaction between the magnetic field and the electric current is magnetic induction, measured in tesla or in gauss. The strength of electromagnetic field in the operating area of the AVS 100 depends on the purpose of the unit and varies between 6.4×104 and 20.0×104 А/m. The important parameter in the inductor is the length and bore diameter. Calculations show that with the ratio of inductor’s length (lin) to bore diameter Din up to 0.3, the current of salient pole inductor is less than that of non-salient pole. With larger a non-salient pole inductor consumes less current. To optimize energy consumption and for better manufacturing technology, the AVS-100 and AVS-150 use salient pole inductors, which draw less current. Energy consumption in the inductor depends on its internal geometry and field strength. Consumption of energy in the chamber is defined only by its design, material and the thickness of the walls and does not depend on magnetic field strength. To reduce energy consumption, we manufacture the chamber from a non-magnetic material (stainless steel). The chamber can be designed in several ways depending on the requirements of the processes in the chamber. The systems are air tight, do not require dynamic seals and consists of an electromagnetic dives with cooling system, operating chamber and a control panel. Processes in AVS are intensified by mixing and dispersion of components, accoustic and electromagnetic influence, high local pressures and electrolysis. The units AVS100 can be efficiently used in many industries: construction, machine building, chemical, agricultural, food production, mining and pharmaceutical. It is used for production of multicomponent emulsiosn and suspensions, acceleration of production of finely dispersed mixtures, activation of materials both in dry form and dispersed in water, leading to improcved properties of resin and decreased vulcanizing time; for complete purification of industrial waste water from phenol, formaldehyde, heavy metals, arsenic, cyanides, acceleration of heat treatment, production of protein material from yeast cells; improvement of microbiological stability of food products and activation of yeast in bread baking; improvement of crude products and finished products from meat and fish; intensification of extraction processes, including production of broth, juice, pectin etc; production of suspensions and emulsion of increased microbiological safety in food production without the used of staibilizers and increase of product output. For liquid phase processes, strainers are installed on the sides of the bush, or at outlet end only (Fig.3). If fibrous materials are processed, labyrinth type strailers are installed. These devices hold the ferromagnetic particles in the work zone. Granulation and mixing may be performed not only by ferromagnetic pellets, but also by knoves (fig. 4), tubes (fig.5) or rotor (fig.6). In these cases the strainers function as filters (separators). Fig. 4. AVS chamber with knives: 1 – knoves; 2 – chamber; 3– mesh filter; 4 – bush. Fig. 5. AVS chamber with tubes: 1 – chamber; 2 – mesh; 3 – bush; 4 – tubes; 5 – filter tube. Ferromagnetic cylindrical elements, knives or tubes may be made of carbon steel, nickel etc (any ferromagnetic metal). For example, cylindrical ferromagnetic elements may be manufacture with wires or use rollers of needle bearings. If necessary to prevent contact of the ferromagnetic material with the processes materials, the former can be covered with a polymer (polyethylene, polyvynilchloride, fluoroplast etc). Fig. 6. AVS chamber with rotor: 1 – chamber; 2– bronze bushings (lubricated and cooled by the processed liquid); 3 – lid; 4 – rotor. Fig. 7. Ferromagnetic element portioner: 1 – loading hopper; 2– electromagnet; 3 – lid; 4 – electromagnet body; 5 – supply chamber.